Winds of Lindy: How Does Your Garden Grow? I've decided that next year I want to embark in growing a garden. This year we had a few measly pots with strawberries, snap peas, tomatoes, and some lettuce. My daughter thoroughly enjoyed picking off the berries, which never even made it to the bowl. 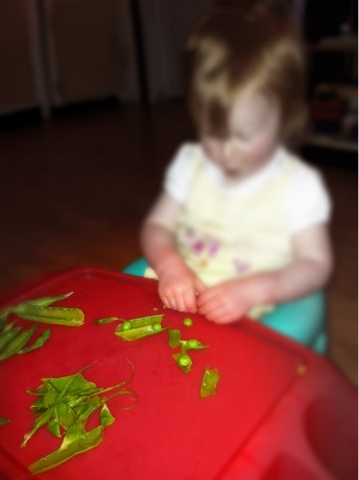 I believe the only reason she would try the peas was because we went out and picked them ourselves. She was so excited to eat them. I figure, then, that she would be more open to sampling vegetables if we grew them ourselves. (Fruit we have no problem with. She could live off of fruit.) I remember having a garden when I was about 12. I think it may have been the only year. I remember gorging on so much broccoli. They taste so good freshly picked and pesticide free. I am a little fed up with pesticides. But the world consumes so much food I can see how we got to this point where what we try to nourish ourselves with is drenched in poison as it grows. I am certain it isn't good for us. And I am very unhappy with the idea of yield and profit coming before our health. I will admit that as a cancer survivor I worry too much about the effects of what we eat on our bodies. I am trying to cut down on sugar and avoid processed. I am trying to up my organic fruits and vegetables. My husband thinks I am neurotic but he doesn't realise we still eat plenty of what a fanatically health conscious person would not. I will let some things slide, but change won't come through indifference. If no one wanted the pesticide laden food, maybe they would make changes. But I think ignorance is the biggest issue. For the longest time, I didn't even know what GMO was and figured it was something the scientists were careful with and so it was okay. They wouldn't harm our food supply, would they? But then I learned what GMO means. Genetically Modified Organisms have been altered at the gene level. For our food this often means seed altered to grow plants resistant to pesticides. Then, instead of farming in separated rows with room for machinery and people to get in and remove weeds, they can pack many more plants in and just drench them with Round-Up. Oh, and who invented these GMO seeds? The makers of Round-Up. They're happy. And the farmers are happy because It saves them money on staff and equipment and produces much more crop. Pesticide soaked crop. More is not better. So I want to avoid it. All my daughter knows is what tastes yummy. She doesn't know the source or how much we pay. She just tries what is in front of her (and makes suggestions, which usually include berries). She struggles with the texture of the green leafy group. But she'll drink a spinach smoothy and I get her some greens. Maybe we'll experiment with the myriad of leafy options in our future garden. I can see it expand now. We'll plant sweet peppers and zucchini. Hmmm, this might be work. Of course, I'll look into what grows successfully in our area. Unfortunately, I can't grow bananas. We consume an absurd amount of those in this house (smoothies, pancakes, banana bread, snack). You'd think we were a bunch of monkeys. Nope. Just a growing family that loves food and might as well get nutritional benefits on top of our taste bud experiences. And some planting and sowing bounty too.